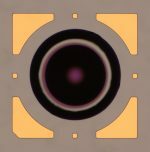 InGaAs/InP high-speed photodiode chip with a tapered coplanar transmission line and an integrated backside lens. The bottom illuminated p-i-n photodiode structure is optimized for data- and telecom applications of at least 28 Gb/s and offers an excellent responsivity and high speed of response in the wavelength region from 1260 to 1620 nm. 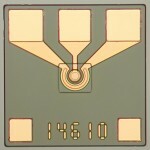 The photodiode has a low capacitance and achieves full speed at low bias voltages.